It looks like the Lenovo Vibe Z from last year is due to get a follow-up pretty soon. 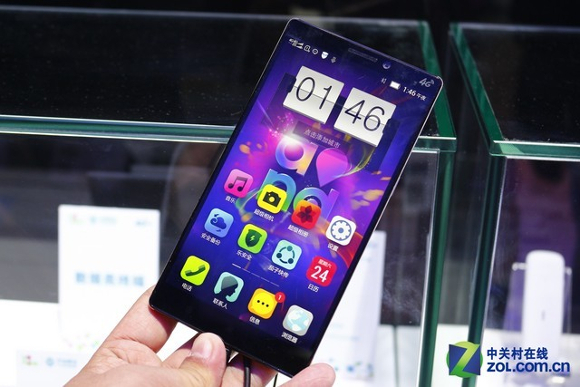 That's because a Lenovo K920 has been spotted at China Mobile's booth at Mobile Asia Expo. And since the Vibe Z bears the model number K910, the purpose of the new device becomes instantly clear. The Lenovo K920 features a unibody design that looks metallic but probably isn't. In terms of specs it will be a beast, coming with a 6-inch 2560x1440 pixel touchscreen, which in fact is Lenovo's first to have such a high resolution. A 16MP camera is on the rear and a 5MP unit is there for selfies. The phone will be powered by Qualcomm's quad-core Snapdragon 801 chipset, with a CPU clocked at 2.5 GHz, and will sport 3 GB of RAM. Internal storage is set at 32GB, and you can expect Android 4.4 KitKat to be on board. The K920 has support for China Mobile's TD-LTE, complete with dual-SIM functionality. Whether there will ever be a version of the smartphone for other parts of the world is unclear at this point, as is when it will be released in China (or even officially announced). Update: An eagle-eyed reader contacted us to point out that you can actually (if barely) make out the words Optical Anti-Shake next to the camera sensor on the K920's back. This seems to be what Lenovo is going to call the Optical Image Stabilization feature that we know from smartphones made by other companies. Thanks for the tip, mclarenfan1968!